But Fruity Fortune is no run-of-the-mill online demo slot. Beyond the standard fare, Fruity Fortune Plus includes all the features the modern internet casino player expects from a slot machine: We’re talking here about bonus rounds and free spins that put this game in a class with those creations of the top-level online demo software producers out there. Fruity Fortune Plus is played on five reels and 25 paylines. Unlike the 3-reel slot machines of yesteryear which typically paid out wins on a single payline running straight across the game board, on three paylines running horizontally or even on five paylines including the three horizontal lines plus diagonal lines, today’s online casino demo slots may pay out on anywhere from nine to 100 paylines. Recent years have seen the rise of games with 243 (or even more) paylines, a design that essentially eliminates the basic concept of “lines” altogether, but we’ll avoid digression here and be thankful that Fruity Fortune Plus keeps things sane and calculable at 25. In the “base game,” i.e. the standard reels played in the standard fashion, Fruity Fortune Plus pays out when three or more symbols appear on an active payline. Top win here comes with landing five bunches-of-cherries symbols on a ‘line: This is worth a whopping 1,000 coins. The lucky 7 symbol – another staple of online slot machines of the fruity flavor – is a wild, meaning this one substitutes for any other symbol to help form winning combinations on active paylines. And five lucky 7s on a payline are worth an incredible 10,000 coins! The scatter symbol is represented by the … oh, let’s call it a fruit cocktail symbol. 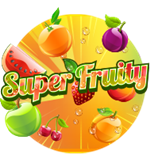 In the Fruity Fortune Plus slot game, as in many others, landing three scatters or more earns the lucky player free spins. In this respect, Fruity Fortune Plus is quite magnanimous, indeed, as up to 75 free games can be won when five cocktails appear in a single spin. Then there’s the video bonus round, which does not have a specific name but wishes you “Happy Slicing!” Land three helpfully-labelled “Bonus Round” symbols and a special screen opens into the sort of video game action that only modern demo-play casino slots can provide. You know that ultra-popular tablet game called “Fruit Ninja”? The player can put his/her skills learned in that game to the test in the Fruity Fortune Plus bonus round: Random fruits fly into the air and with the mouse the player satisfingly slashes at said fruit, slicing ‘em up and collecting coinage with each swipe – this destruction can result in literally hundreds of coins in one of the most fun ways to rack up winnings in a demo slot game that we can think of! Nearly as ubiquitous in all formats (tablet, mobile device, PC, etc.) as Fruity Fortune is Pub Fruity slot game. Released by demo slots software giant Microgaming back in the late 1990s, Pub Fruity has transitioned to mobile formats beautifully and remains one of *the* top online slot machines of any type. This 3-reel, single-payline game includes the trail feature, which can award serious prizes, and a video bonus round themed on a darts competition. Pick a player and cross your fingers – but even if your guy/gal finishes third, you still win thousands of coins! Fruit Case demo slot isn’t so much a slot as a “Candy Crush”-style or “cascade”-type game. Anthropomorphized fruit symbols fall onto the reels and winning combinations are crushed with a satisfying sound effect. After the winning symbols are crushed into pulp, they’re removed from the screen for new combinations to fall into place – better yet, each successive win adds a 1x bonus multiplier up to a possible 8x maximum. Freaky Fruits free play slot is yet another in the fruity fortune slots games subgenre with human-looking fruit symbols – and also a goofy-looking worm munching its way through ‘em. Don’t worry, though, this worm is a wild symbol that can also start the incredibly fun “Worm Races” video bonus round. Pick a colored worm and watch it fly – um, crawl – speedily down the racetrack for hundreds of coins in winnings. Finally, Fruit Stack is a must-try for fans of wheel of fortune-type demo casino games. This one at first glance appears decidedly old-school, with nine paylines in the 5-reel base game. Trip enough of the diamond symbols, though, and get prepared for big winnings by spinning the big, multi-colored wheel on which essentially every spin is a winner. Naturally, these titles are but scratching the surface of an entire class of riffs on the oldest of old-fashioned slots riffs. Any of these and much much more can be had with just a click – and all may be played for free: no register, no download! Slot machine games from Fruity Fortune Plus to yesterday’s classics may all be enjoyed here.